I'm confused - if the velcro is "...now pretty well standard equipment for all Laser sailors who understand the value of a tight leech" why are you promoting sales of it through one specific retailer ? Interesting ... When I got my Etchells, it had a Velcro strap to hold the leech down, but that strap went missing. Gerald used a stitching awl and some supplies from a sewing store to make a new Velcro strap, but after about a year it broke. Since then we've been making do with string, but we're looking for a good, sturdy Velcro strap. Meanwhile, on another topic, you were looking for sailing blogs from various states. I don't think Gerald's blog, "(Enter Title Here)," (http://gbyrnes.blogspot.com/) qualifies yet, but you might keep an eye on it as a candidate for a sailing blog from Arizona. Right now, he is (I hope) keeping busy with his studies, so he isn't doing much with his blog. And he's had some problems with software glitches, so his blog isn't accepting comments right now (getting that fixed is waiting until he has a break in studies -- again, I hope). But he's sailing on the ASU sailing team, and he has just had his first millenial visitor (number 1001, not the artificial number 1000), who happens to have been from Rhode Island. a) Intensity Sails sent me a sample of their strap to review. I used it for over a year. It worked well. This is the review. b) It is cheap compared to other makes. c) If any other vendor wants to send me a clew strap, a sail, 10 years supply of energy bars, two new boats.... whatever... I would be happy to review them. Thanks carol anne. Actually I did stop by Gerald's blog a few days ago. Hope he has a good time with the sailing team and finds the time to blog about it. I see Pat also has written about Arizona sailing so I could always use him for New Mexico and Arizona. In terms of fixing the velcro strap, how tight is "tight"? Tight enough that the lower edge of the sail sits neatly on the boom? Or tight enough that the cringle itself is nearly down onto the boom? How tight is tight? How fast is fast? How high is high? This is getting very Zen. Seriously. How should I know? I've already admitted I don't know why tight is goodness. And if you've read this blog at all you will know that I may well be the worst Laser sailor in the world who has been sailing the boat for 25 years and sails 100 days a year (perhaps). But for the record, I always tie the strap as tight as I can. Much tighter than the one on the photo. So tight that the cringle is lying alongside the boom. Then again. I could be wrong. It has been known. If you are looking for polite company, you are in the wrong place. Polyphony, see also Andrew Campbell (USA Laser Olympic sailor) writing in Sailing World. "The clew tie-down is all about keeping the clew as tight to the boom as possible, which keeps the leech tension tight. In the past you'd do this by wrapping a line several times around the boom, passing it through the grommet, and tying it. The problem was the wraps created friction and inhibited the outhaul from being eased quickly and easily. 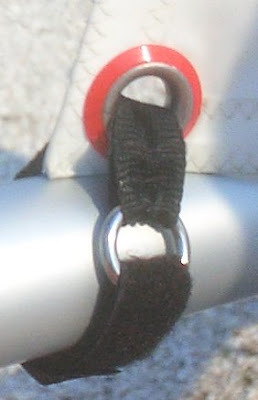 Reliability of the knot was also an issue, as was the type of line you used (stretchy line equals poor leech tension). The legalization of a Velcro strap (like a watchband) eliminated the need for tying knots at the clew and lessened the friction." He's a far better sailor than me but I think my version of "tightness is goodness" was funnier, (and longer).